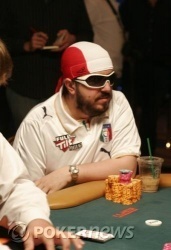 The "Italian Pirate" has just plundered the bracelet here in Event 24. Max Pescatori outlasted a pro-heavy field of 457 players over the course of three long days to take the title and the hardware. It was a hard-fought battle for our champion. He jumped out to a chip lead early in Day 2, but found himself in the middle of the pack by the end of the day. Today, he sat patiently while the opponents at his table went after each other, sticking his nose in only when he had a chance to snag some chips. Midway through the day, he reacquired the chip lead once again, only to watch Kyle Kloeckner overtake him prior to the heads-up battle. 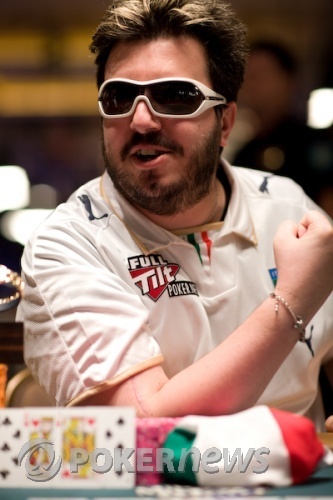 But Pescatori made quick work of his opponent, running down his chip stack and capturing the title. For his three days' worth of work, Pescatori will take away $246,471 and something money can't buy: his second WSOP gold bracelet. Congratulations to Max Pescatori, Champion! Max Pescatori raised from the button to 72,000. Kyle Kloeckner made the call from the small blind. The flop came down all red, . Kloeckner checked over to Pescatori, who made a bet of 110,000. Kloeckner thought and then made the call. The turn was the and Kloeckner checked one more time to Pescatori. Max asked the dealer to verify the pot size and then announced he would bet the pot, 364,000. Kloeckner went into the tank for several minutes. He mentioned, "I think you know what I have," and had a grim look on his face. After thinking for another couple of minutes, Kloeckner announced he was all in. Pescatori made the call and the hands were revealed. The river came off the and Pescatori jumped from his chair and raised his good arm in the air for victory. Italian words were screamed from the crowd as Pescatori ran over to high-five his buddies that railed him for the entire final table. 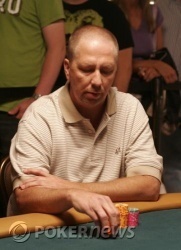 Kloeckner gave a strong performance and didn't give up when faced with adversity at this final table. He earned $152,410 for his second-place finish. Both players saw the flop of . Kyle Kloeckner checked and Max Pescatori bet 30,000. Kloeckner called. The turn was the and it went check, check. The river was the and Kloeckner checked. Pescatori bet out 100,000 and Kloeckner called. Both players rolled over full houses, but Kloecker's was a little better than Max's to take the pot. On the last hand of hold'em, Kyle Kloeckner and Max Pescatori both saw a flop for the minimum. The flop came and Kloeckner bet out 30,000. Max called. The turn was the and Kloeckner check-called a bet of 50,000 from Pescatori. The river fell the and both players checked. Kloeckner turned up for a pair of queens. Max tapped the table and then mucked his hand. Max Pescatori raises it to 90,000 from the small blind. Kyle Kloeckner makes the call, and the two men see the flop. It comes , and both players check. The turn is the . Check-check again. The river brings the . Pescatori leads out with 100,000, and Kloeckner makes the call. Max flips over , and it's good enough as his opponent mucks his cards. Max Pescatori raised from the button to 65,000 and Kyle Kloeckner called. The flop came . Kloeckner checked and Pescatori bet out 100,000. After some thought, Kloeckner raised to 350,000. Pescatori thought and thought, just as Marcel Luske jumped to the rail to watch the action. Pescatori studied for a few minutes before announcing all in. Kloeckner immediately folded and the Italian scooped the big pot. Max Pescatori folds from the button. Kyle Kloeckner raises it up, making it 80,000 to go. 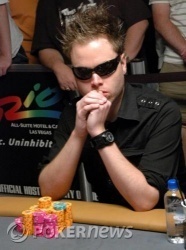 Greg Hurst makes a reraise, stacking out a total of 175,000. Kloeckner calls. Hurst needs some help, but the board runs down , , and that's going to do it for him. Kloeckner knocks him out and moves his stack up to 1,300,000. Hurst put on a strong performance today, doubling up early on to give himself some breathing room. He was disappointed, but he will pocket $94,599 for his three-day run. Picking up the action on the turn when the board read , Max Pescatori checked over to Kyle Kloeckner. Kloeckner bet out 90,000 and Pescatori called. The river was the and Pescatori checked again to Kloeckner. This time, he bet 130,000. Pescatori quickly called. Kloeckner showed and then Pescatori rolled over for a better ace high with a six kicker and scooped the pot.